This is Paul posting for the first time. 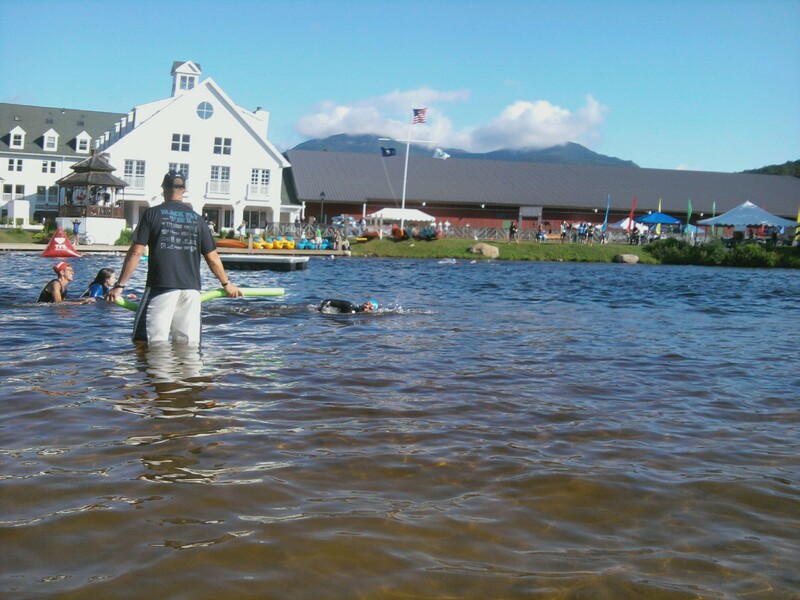 This past Saturday was my 2nd triathlon of 2011, the Black Fly Tri in Waterville Valley, NH. 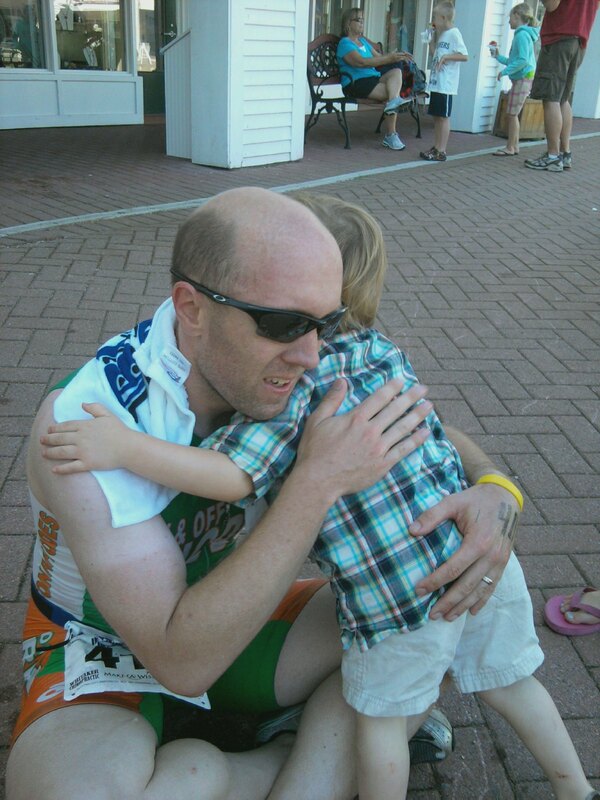 They called it an international distance, but it was more like a really long sprint distance with a 440 yard swim, 20.5 mile bike ride, and a 5 mile run. The alarm went off at 3:50am on Saturday morning and I was up instantly. Nervous is my normal routine on race day, and this morning was no exception. The car was already packed with all my gear so I just had a normal sized breakfast and then headed out on the road at 4:20am. I wanted to get there early to set up and make sure I got a good parking spot for the car……walking far after a race is no fun. It took about 20 minutes shorter than I thought to get there and registration was not even open yet, so I had plenty of time to get things set up…and hit the bathroom about 4 times (remember nerves). After a few trips back to the car, forgot timing chip, did not have a swim cap in race packet so I had to go back to registration, and forgot a water bottle I was all set. That is until I pulled my goggles out and the seal on the left eye was half way torn off. Luckily there was a shop set up in the Village Square selling goggles, for cheap to boot, and in orange. I was now ready to go. I hit the water for a quick warm up and then came out to await my start time. The swim is a time trial start with one person starting every 5 seconds, and with my number being 411 it was almost 40 minutes until I actually hit the water. It gave me time to talk with Miiko Bradley, the Robichaud’s, and a few other people I know. That helped me not think about my nerves too. Finally time for me to hit the water. I will make this race section kind of quick. Ran into the water, and started passing a lot of people. It is amazing that there are that many people who are slower than me in the water. I will no longer call myself a slow swimmer, just a not-fast-swimmer. This is where I made my only mistake all race. I started rounding one of the buoys marking the course and heading towards the next one……thing is I still had two more that I should have headed straight towards instead of starting my turn. The kayaker in the water let me know quickly, but I did loose some time here. Once I was back on course and swimming along the back side along the edge of the beach where Shannon, Bella, and Noah were playing and my arms started touching the bottom. What does a not-so-fast-swimmer do in this case? Get up and run! I ran about 15 feet and then dove back down when it got deep enough again. Shannon waited to take a picture until I was actually swimming again. The rest of the swim was uneventful. Coming out of the water there were wetsuit strippers (hehehe…strippers) to help facilitate a quick transition time. Onto the bike and time to hammer. 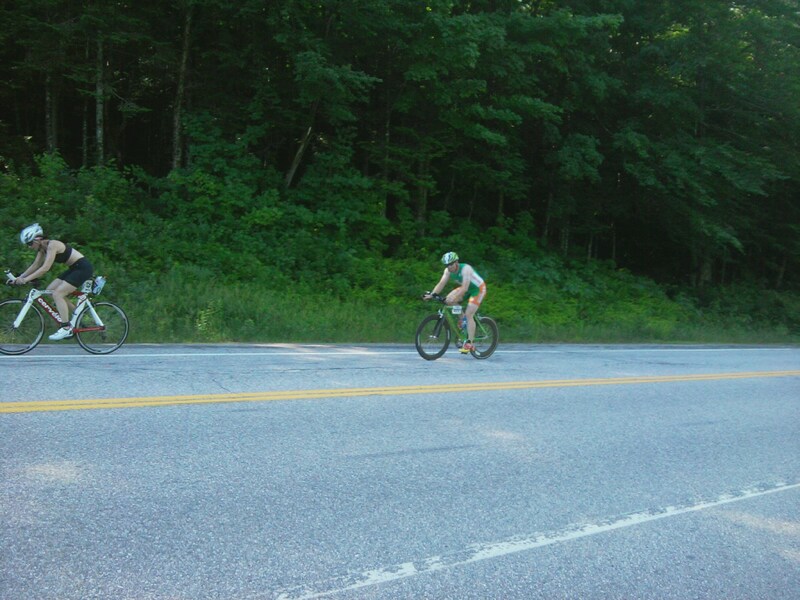 I passed some where around 100-150 people in the 20.5 mile jaunt (suffer fest) down and back up Rte 49. I was hoping to be under an hour and must say I accomplished that feat by averaging 20.9mph (so close to 21mph). I saw Shannon and the kids before they saw me, but she was able to get a few shots and lots of cheers in for me. It is always nice to have family supporting you at the races. The run was a sufferfest. I have no GPS to tell me what pace I am running at, I only go by feel. Well I felt like I was going slow, and I thought I was going to die, but I was passing lots of people still! It seemed to take a long time to hit the 2.5 mile point for the turnaround, but once I did, I started to feel faster. Until the last mile when I thought I was going to vomit. I was extremely surprised to see my average pace at a 7:27 min/mile. I felt like I was going way slower. Maybe one day I will actually get a GPS to verify whether I am actually a sloth or just feel like one. I ended up 75th out of 460 so it was a good day. Plus Bella and Noah gave me kudos! It was nice to just stand in the pond afterwards while the kids played and get my wits back. We headed down to Plymouth for lunch instead of staying up in WV. Pizza and then a visit to the bakery for a raspberry square and iced coffee helped get me home. By the time we got home it was only 3pm, but I was approaching 12 hours of being awake. We took a little down time before heading to the Fisher Cats game with Travis. A long, but very good day, with the family. You did great! LOVED watching and supporting you!